Hello, Book pals its been so long since I've been here. I do have to tell you I miss you all so much. I always enjoy when I get to share a brand new book that I enjoy with you all. 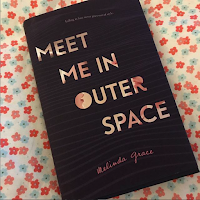 My latest book review is about Melinda Grace “Meet Me in Outer Space”. 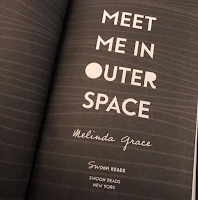 This book is published by Swoonreads and I bought it from Amazon on March 3, 2019, as a Preorder. Now I want to share this awesome book with all you through a great review. In this beautiful book, we meet Ms. Edie Kits who has a central auditory processing disorder which makes it hard for her brain to Process words when people are talking. It especially harder for her when the language is foreign such as French 102 class. In comes the current French 102 TA Wesley Hudson. Hudson volunteers to help Edie understand the French language better so she can Pass the class. But maybe there's more to Hudson Help than appears to the naked eye, such as feelings!! "Feelings" are the last thing Edie wants because She just wants to pass French 102 and go to Paris to study fashion. Does Edie go to Paris or does the "Feelings" ship with Hudson win or do they both win out in the end. If you all want to know what Happens between Edie and Hudson .. Run. don’t walk. run to the nearest Bookstore or Library and get this Book ASAP. Okay, I have to do this now. OMG,😁😁 I loved this Book!!!! It has been one of my Faves this year. I have to be honest I've been in a back and forth book slump this year and this book help dragged me back out. This book just refreshed my need to read, is the best way I can describe it. I loved how Melinda describes Edie in fashion School, it took me back to my days of Art School. I went to a school that was Art for Cooking, Fashion, and web. While in school, we were encouraged to critic each other work and spend time with each other to be more creative. So the moments where Edie is in class designing her dress just took me right back to my days at Art School. I also had a Disability Act in School where I was allowed a little extra time to Complete work, but I did experience Teachers like Edie’s Prof, who didn’t understand why I needed just a little extra help or time. So I could totally related to Edie experience at that moment. So I rated this book Five stars🌟🌟🌟🌟🌟 because for one I love how relatable all of the characters were for a New Adult book. I loved how Melinda put a real human essence to Edie and Hudson that you don’t always see in a New Adult. Even in the private moments between Edie and Hudson, when they are just being a couple I felt like I was reading a real couple. As I stated before, I instantly felt like I was back in College while reading this book and totally related to most of the College moments. That's just how real the story came across as I read the book. Edie as a female just screams Independence in every way but I also love that she let Hudson in. Hudson is amazing, he reminds me of David Tennant as the 10th doctor in that Nerdy way. Not only was Hudson smart and helpful but also Encouraging to Edie as the book went on. He just goes above everything and researches Edie disability to understand how to help her with passing French. He spends time trying to educate her with Pronouncing different french words and their sounds. He encourages her to pursue her dreams of doing Fashion in Paris while telling her, he will be waiting! He is an amazing male character and actually I wish I would see more male characters like him in the New Adult Genre. These characters were just so well written and so relatable, Melinda did a great job with them. I did love Melinda writing throughout the whole book. She made you understand what it liked to go to college with a disability that many won't understand. She wrote several characters who came across very Human which is very rare to me in New adult. She gave us the cutest most adorable romance story that made sense in a "real world" couple way. For example, Hudson didn’t just walk away from Edie when she pushed him away, he fought for her. Also Edie while falling for Hudson kept denying her feelings about him and thats a very human trait. The last example is a perfect example of a Human trait not very well written in New Adult. Melinda just gave us all wonderful examples of how "Real Human" traits can be given to book characters and for this reason alone I will read anything she writes. I hope after hearing all my raving in this blog that you go get this book. 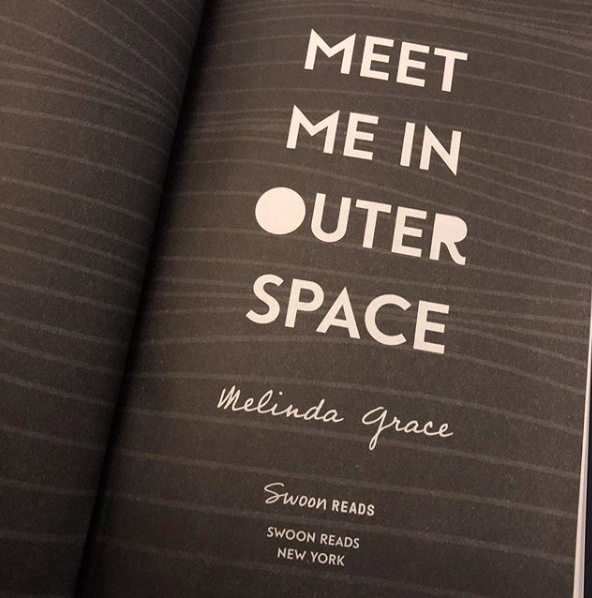 Meet me in outer space is one of my new faves and I probably will end up rereading it this year, thats how much I love it. As always I will leave links to the book down below along with my Social Media and Melinda’s. Thank you for reading another blog of mine and Hopefully, i will see you all soon.